Warner Bros.' Captain Thunder contains some of the darndest Mexican accents you've ever heard in your life. The star is Hungarian-born Victor Varconi, portraying a legendary south of the border outlaw who tries to force Canadian senorita Fay Wray to marry a rival rustler whom she despises. She pleads with the bandito so pathetically that he is moved to grant her a single wish. Without hesitation she chooses her poor but true love. The bandit king, being a somewhat honorable fellow grants the wish and without a twitch, guns down the wicked cattle thief. Fortunately the film was played for comedy, a wise decision since it probably would have garnered laughs as a straight drama anyway. 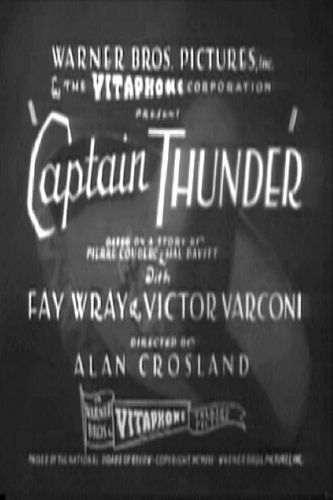 No fewer than four writers worked on Captain Thunder, and that folks is never a good sign. The true "bandit" in this film was Jack Warner, who picked the pockets of those filmgoers who thought they were going to see a thrilling melodrama (or at least a film with a semblance of coherent plot).